This was my first time reading anything from Alyson Noel. I've heard of her Immortals book and heard that it was a great read. 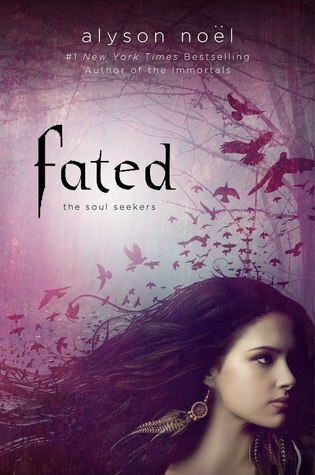 Fated however isn't bad, but wasn't as great as I expected it to be. The beginning started off slow, really slow. It took me a bit to actually get through the first couple of chapters, but after a while I managed to finally get to where things were starting to pick up to where I didn't want to put the book down. My favorite part about this story was reading and learning about Seekers, their background and what all they could do. I think Alyson Noel did an amazing job describing to us about the background of the Seekers. As far as the main character, Daire, I think I had a love/hate feeling about her. At times she made me mad and then there were times where my opinion of her changed and I felt what she was going through. The brothers Dace and Cade reminded me of a few other stories/movies/tv series I've read/watched in the past, one evil brother and one good brother. Though a good idea, I would have loved it if there was just one brother fighting the evil to become good. Overall, not a bad read. The descriptions in this book were amazing. As I was reading I could see in my head exactly what the land/place looked like and what the characters looked like, which in some stories is very hard to do. I wouldn't mind reading where this series goes. Since the first part of this series already gives us the character's background and what the Seekers are, I'm intrigued to see how the second part of the series will start. Disclosure: All opinions are my own. I received Fated at no cost for the purpose of this review. No other compensation was received.